Read for This Week’s Study: Gen. 33:12-14, Ruth 1:16-18, John 17:21-26, Gal. 3:28, Eph. 2:11-22, 5:21-6:9. Memory Text: “That they all may be one, as You, Father, are in Me, and I in You; that they also may be one in Us, that the world may believe that You sent Me” (John 17:21,NKJV). Yet whether as parents or children in a family, we all struggle with the same thing, and this is our sinful fallen natures, which can make unity in family life very challenging, to say the least. Yes, in the body of Jesus Christ on the cross all humanity has been reconciled to God and to one another (Eph. 2:13-16, Col. 1:21-23), but on a daily practical level we must appropriate for ourselves the grace of Christ, which alone can make family unity a living experience for all who seek it in faith. This must be a daily experience in our lives. Fortunately, through the grace of Christ, it can be. Study this week’s lesson to prepare for Sabbath, May 18. What illustration does Paul use to describe the new unity that exists between peoples in Christ? How has Christ made “one” out of “two”? Eph. 2:11-22; see also Gal. 3:28. The cross of Christ removes the barriers that separate people from each other. Walls separated worshipers in the Jewish temple, men from women, and Jews from Gentiles. Describing the unity of Jews and Gentiles in Christ, Paul used language that applies equally to other divisions between nations, people groups, social strata, and gender. “To create out of the two a single new humanity in himself, thereby making peace” (Eph. 2:15,NEB) is good news that helps couples to truly know “one flesh” unity in marriage. Also, by faith in Christ, long-divided families can be reconciled. It’s one thing to quote Bible texts about oneness in Christ; it’s wholly another to actually experience it. What practical changes does Christ bring to our lives that enable us to experience the oneness and unity we have been promised? See, for instance, Rom. 6:4-7, 2 Cor. 5:17, Eph. 4:24-32. “Picture a large circle, from the edge of which are many lines all running to the center. The nearer these lines approach the center, the nearer they are to one another. … The closer we come to Christ, the nearer we shall be to one another”. – Ellen G. White, The Adventist Home, p. 179. “Between father and son, husband and wife, … stands Christ the Mediator, whether they are able to recognize him or not. We cannot establish direct contact outside ourselves except through him, through his word, and through our following of him”. – Dietrich Bonhoeffer, The Cost of Discipleship (New York: The MacMillan Publishing Co., 1979), p. 108. “May the Lord make your love increase and overflow for each other and for everyone else” (1 Thess. 3:12,NIV). Jesus prayed to His Father that His followers would “be one as we are one” (John 17:22,NIV). Summarize what Jesus was saying here, focusing specifically on the role of love needed in order to achieve this oneness. Unity among His followers was on Jesus’ mind in this prayer. Experiencing agape love is essential to this unity. “Agape” is the Bible word for God’s love used in this prayer and in many other places in the New Testament. Such love is God’s very nature (1 John 4:8), and it identifies Jesus’ followers (John 13:35). God’s love is not natural to the sinful human heart. It comes into one’s life as Jesus dwells with the believer by His Spirit (Rom. 5:5; 8:9, 11). “Love each other as I have loved you” (John 15:12,NIV). The disciple John, who wrote these words, was once not lovable but proud, power-hungry, critical, and hottempered (Mark 3:17; Luke 9:54, 55; see also The Desire of Ages, p. 295). Later in life he remembered how Jesus had kept on loving him in spite of these traits. Jesus’ love gradually changed John, enabling him to love others in Christian unity. “We love Him because He first loved us” (1 John 4:19, NKJV), he wrote, and “if God so loved us, we also ought to love one another” (1 John 4:11,NKJV). Read 1 Corinthians 13:4-8. Try placing your name where the word “love” appears. How well does it fit? Ask Jesus to bring these qualities of love into your life by His Spirit. What changes might the Spirit prompt you to make in order to reach this Christian ideal? “If pride and selfishness were laid aside, five minutes would remove most difficulties”. – Ellen G. White, Early Writings, p. 119. As human beings, our natures have been corrupted by sin. And, perhaps, the greatest example of that corruption is the curse of selfishness. We seem to be born selfish; we can see this reality in small children, whose basic nature is want for themselves. “Me, me, me … ”. By the time we reach adulthood this trait can manifest itself in some pretty terrible ways, especially in the home. What counsel does Paul have regarding humility and service in relationships? Eph. 5:21. How do you think this attitude contributes to unity in the church? Why is it so important at home? Eph. 5:22-6:9. The word “submit” (Eph. 5:21) means to place oneself humbly before another person on the basis of voluntary choice. This unique principle began with Christ (Matt. 20:26-28; John 13:4, 5; Phil. 2:5-8) and characterizes all those who are filled with His Spirit (Eph. 5:18). “Reverence for Christ” is what motivates people to submit in this way (Eph. 5:21, NIV). Mutuality in self-giving was, and still is, a revolutionary Christian teaching about social relationships. It brings to life the spiritual reality that all are one in Christ; there are no exceptions. Three pairs of relationships are addressed in Ephesians 5:22-6:9 – the most common yet most unequal relationships in society. The intent is not to reinforce an existing social order but to show how the faith culture of Christ operates when there is a radically different voluntary submission of believers to one another. Parent-child commitment (Gen. 33:12-14, Exod. 2:1-10). Family commitment (Ruth 1:16-18; 2:11, 12, 20; 3:9-13; 4:10, 13). Marital commitment (Hos. 1:2, 3, 6, 8; 3:1-3). When we commit ourselves to another person, as in marriage or in the decision to bear or adopt a child, there must be a willing surrender of ourselves in order to make a different choice in the future, a surrender of control over an important segment of our lives. Laws may restrain negative behavior, but marriage and family relationships need love within them to enable them to flourish. Further Thought: Ellen G. White, “A Sacred Circle”, pp. 77-180, in The Adventist Home; Testimonies for the Church, vol. 6, pp. 236-238. Unity—the first work. “The first work of Christians is to be united in the family. … “The more closely the members of a family are united in their work in the home, the more uplifting and helpful will be the influence that father and mother and sons and daughters will exert outside the home”. – Ellen G. White, The Adventist Home, p. 37. The secret of family unity. “The cause of division and discord in families and in the church is separation from Christ. To come near to Christ is to come near to one another. The secret of true unity in the church and in the family is not diplomacy, not management, not a superhuman effort to overcome difficulties—though there will be much of this to do—but union with Christ”. – Page 179. Not many people can say that they have spoken with an angel. Farmer Notley Tidwell could — but he didn’t. Instead, he referred to the mysterious stranger as “the man”. One evening in the 1880s, Notley prayed as he trudged home, his fiddle in hand, from a barn dance in the U.S. state of Texas. He was confused. He had been raised to worship on Sunday, but he had been studying the Bible and saw that the Fourth Commandment said, “Remember the sabbath day, to keep it holy” (Exodus 20:8; KJV). As he prayed, a man suddenly appeared beside him. Notley knew everyone in the area, and he had never seen this man before. But he wasn’t startled. The stranger was very pleasant. “He just appeared and started talking to him”, said his granddaughter, Lorena Stigaullde, 94. The conversation soon turned to the Sabbath, and Notley shared his growing conviction that God had set aside Saturday, not Sunday. He expressed bewilderment that he couldn’t find anyone who observed Saturday. The stranger said he knew of a group of people who worshipped on Saturday, and he gave detailed directions to their meeting place. Notley glanced to the side as they spoke, and when he looked back, the man was gone. “He was just there, and he turned, and he was gone”, said his great-granddaughter Reba Seifert, 68. Returning home, Notley told his wife about the unusual meeting and, days later, decided to follow the man’s directions. They led to a farmhouse where a small group of Seventh-day Adventists met every Sabbath. Notley was baptized into the Adventist Church with his wife and their eight children. He later became a local church leader and planted the first local Adventist church, located between the towns of Linden and Marietta, Texas. Although the church is now closed, others have sprung up in the area, including a church in Linden where Lorena attends with other relatives. Notley’s legacy also lives on. His faithfulness to God spawned several generations of mission-minded Seventh-day Adventists who have served as Bible workers, literature evangelists, and special needs leaders in Texas and beyond. 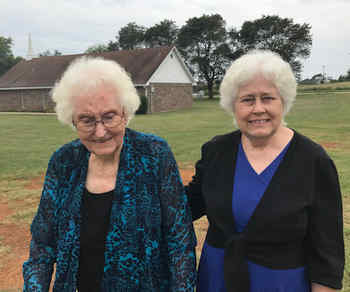 “He became the first Adventist in a large family”, said Reba, one of granddaughter Lorena’s four children. Notley never identified the stranger as an angel, but the family believes that he was sent from heaven in answer to an earnest prayer. “He just called him ‘the man’, but he believed that God sent him”, said Lorena, who heard her grandfather tell the story when she was a girl. “I believe he was an angel”.